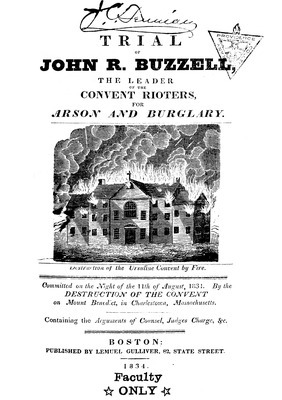 Trial of John R. Buzzell, The Leader of the Convent Rioters, for Arson and Burglary. Committed on the Night of the 11th of August, 1834. By the Destruction of the Convent on Mount Benedict, in Charlestown, Massachusetts. Containing the Arguments of Counsel, Judges Charge, &c.
On the night August 11th, 1834 John R. Buzzell and eleven others were alleged to have broken into and ransacked the Ursuline Convent in Charlestown, Massachusetts. Afterwards the mob set fire to the Convent, which subsequently left the Convent building a hollow shell of its former self. In early December of that year, Buzzell was brought to trial as the State attempted to demonstrate that he had been the mob ringleader and instigator of the crimes of burglary and arson. Not withstanding the lack of a number of important prosecution witnesses who failed to materialize, due to death threats should they testify against the defendants, the Attorney General, James T. Austin, pressed his case against Buzzell. Although the few impeachable eye witnesses Austin did have positively placed Buzzell at the Convent on the night of the fire, Austin failed to carry the day with the jury finding Buzzell not guilty after twenty-one hours of deliberation. Illustrating the anti-Catholic sentiment under the guise of Nativism that existed among Puritan New Englanders, this primary document remains an invaluable resource for researchers examining the social and moral fabric of the early 19th century in New England.